This shoot was one adventurous experience. 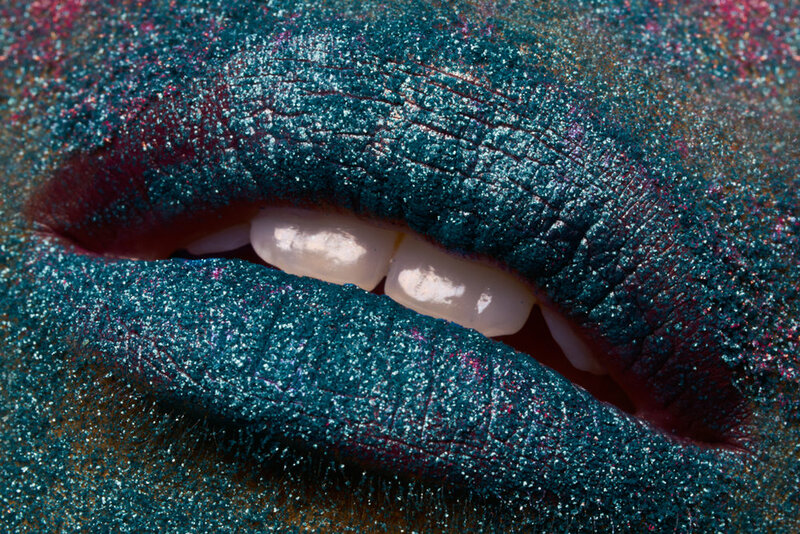 Sonia(MUAH) and I wanted to collaborate on a shoot. 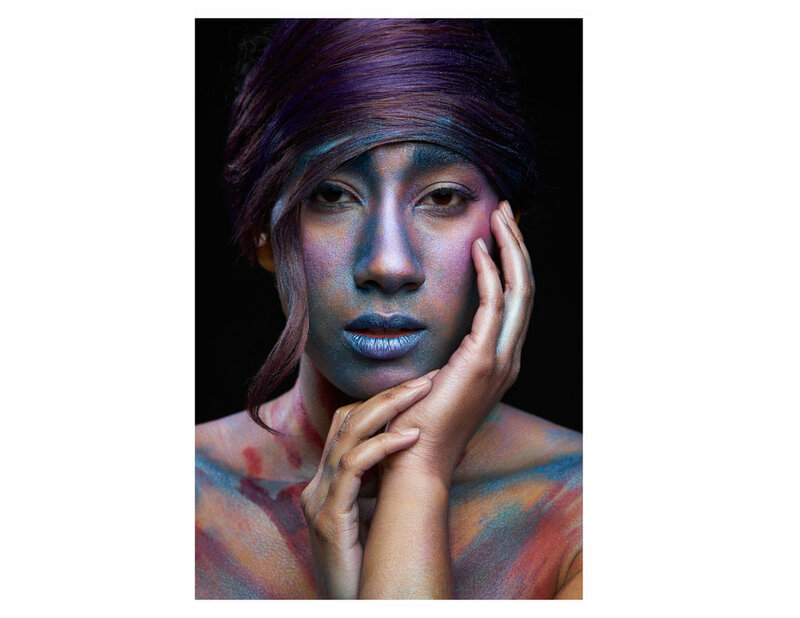 So, we decided to do a beauty shoot and experiment around with the model. It gets onto the nerves when the model leaves the team high and dry at the last minute! Luckily, Camille(Model) told us she was nearby. She saved the day by agreeing to work with us in this project. Before Shoot: Holi is an Indian festival mainly known as the ‘festival of colors’. We came up with a concept to show the dominant colors of Holi and to also show its beauty and vibrance. Color Palette: To showcase the concept we came up with a mood board and a color palette of the colors that are primarily used in Holi. Shoot Day: My idea was to add drama and depth in the images. So, I went ahead with low key lighting setup. I started with a two light setup with a beauty dish as the key light in-front of the model up above at a 45 degree angle and 2nd light with a grid behind the model to separate the model from the background as well as serve as hair light. 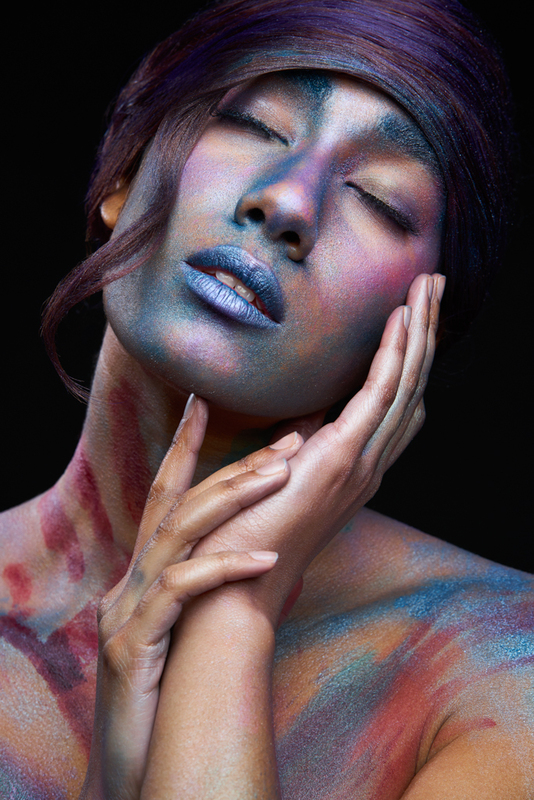 We added the color powder just to her eyes and lips and started the shoot. I used the 100mm Macro lens to go to capture the texture. Camera was tethered to Capture One to check the farming and exposure. It was also used to cull the images that we liked and to post-process the images during the shoot. We covered the face with blue powder and added pink and red just on her eyes to give a sense of depth. Poor girl had to sit with her eyes closed for more than 30 mins and not move a muscle on her face. She couldn't breath as well, Awwww. For the last look, we took off all the textured powder from her face and made sure the colors were still on the skin. There is no holi without Gulaal. Gulaal is a red powder pigment that is used a lot during the festival. To enhance that, we made hand impressions on the face and shoulders with red and blue colors. After Shoot(Retouching): Since culling and post-processing were done during the shoot images were directly moved to retouching. There was not much of skin to retouch in this series. It was about maintaining the symmetry and doing the right selective adjustments to get the colors just right. And the rest of the images in the series had to go though basic cleanup of hair strands and skin imperfections. This is the behind the scenes of Holi Colors for the cover & beauty editorial for Imirage Magazine. You can check out the full blog at the below link. Finally here is the editorial spread and the cover image published in IMIRAGE Magazine issue Living for Love # 3.